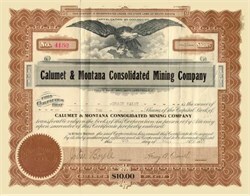 Beautifully engraved certificate from the Calumet & Montana Consolidated Mining Company issued in 1915-1917. This historic document has an ornate border around it with a vignette of an eagle perched upon a globe with its wings spread out. This item is hand signed by the company’s president and secretary and is over 84 years old. The certificate shows signs of wear at the folds.